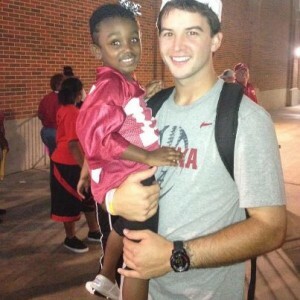 Channel 10 News out of Mobile did a nice piece on AJ McCarron and three-year old Starla Chapman who has cancer. Little Starla and McCarron have bonded over the past few months when the three-year old gave McCarron a special gift before the national championship game that he treasures to this day. This is a touching story about a little girl’s fight with cancer and how AJ has supported her and her family through this plight. Last week, Starla made a surprise visit to McCarron after the Western Kentucky game. To read more about Starla check out this link from News 10 in Mobile.